Joey here. Pennsylvania was a hoot. Until I got motion sickness. We’d crawl up steep inclines, sometimes at less than 2 mph when Jeffrey had to get off and push, really push, LEAN into that handlebar to force the loaded BikeE up 10% grades on roads so rough and narrow that they would have been dangerous to ride even if he had the ability to pedal us up. Then, on the other side — WHOOSH! Jeffrey braked to keep our speed under control but we routinely topped 30 mph, sometimes 40 mph. 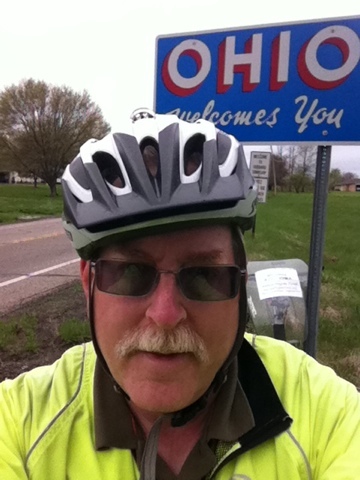 I was too queasy to join Jeffrey for our first Ohio photo (see below). We were well treated in Pennsylvania. Lots of folks took an interest in the Ride, asking questions and making suggestions. The family that directed us to Sterett Road, the kind person at Sheetz who put us on the shortcut to Ohio (but we should take the right fork, not the left! – good thing Nancy was checking the map in NYC and redirected us before it was too late) — they and others took their time and went out of their way to help. 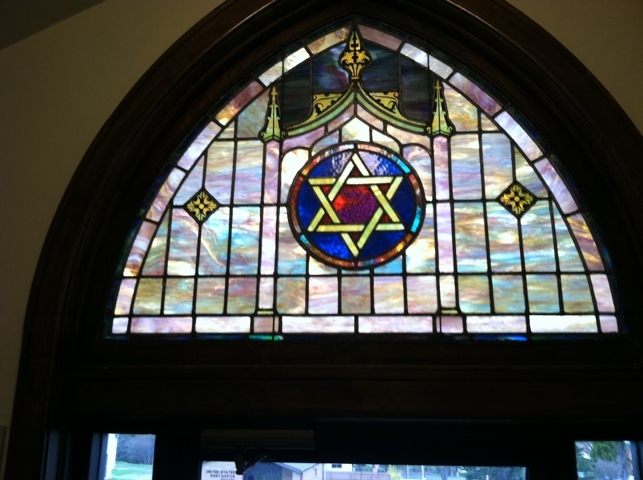 On Sunday we stopped at a Lutheran church to inquire about the prominent Star of David in the front window; the pastor asked about our mission and gave us a tour of the church, an architectural gem built in the 1930s of stone cut from a single block. Later that morning we stopped at Bobette’s diner for some eggs and toast. Some of the regular crowd was telling funny stories and talking about their Harley-Davidson motorcycles, They included Jeffrey in the conversation and made us feel absolutely welcome. When Jeffrey described how Human Rights First helps refugees, one gentleman complained that Mexican immigrants (he said) don’t leave room for people who really need to come here. But he listened politely when Jeffrey said he doesn’t want his own children to have to pick strawberries, and that maybe the problem is that we have become so strict that needed workers are stuck here when they’d rather go home when their work is done. This exchange, and others like it, show that people have been hoodwinked by the xenophobic sloganeering out there, but if you appeal to their intelligence, common sense and native fairness, they will give you a hearing and might even change their minds. Drivers all across Pennsylvania respected us. Cars and trucks, even big diesel trucks, hung back until it was safe to pass, never honking or showing impatience. Two local people said that may be due to the flag we fly from the cargo box. 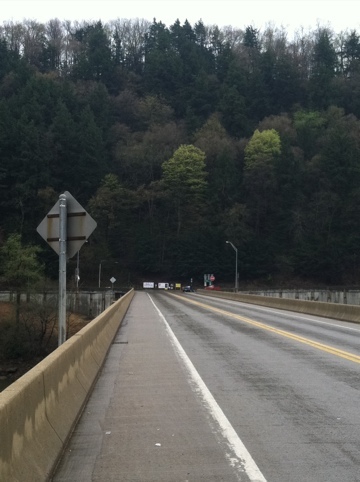 Another said drivers may be reading our signs and showing appreciation for our effort. Yet another said that there have been public service announcements about sharing the road, and that like the anti-litter campaign of the 1960s and ’70s that changed American culture, maybe drivers are starting to think they ought to cut bicyclists some slack. In any case, we almost always have felt safe on the road. Our first minutes in Ohio were good. Right after we crossed the border, rain-damp and hill-weary, a driver gave us a toot, a friendly wave, and a thumbs-up. Then a woman flagged us down, asked if we need anything, insisted on giving Jeffrey a $10 bill (which he will deliver to Human Rights First) and agreed it’s important to provide trained volunteer lawyers for asylum applicants. If others shared her attitude, everyone who needed refuge here would find it, just as they did when we had fewer immigration laws and our government mostly let good people be. Enjoy these scenes from the past two days. Come back tomorrow for the latest news! 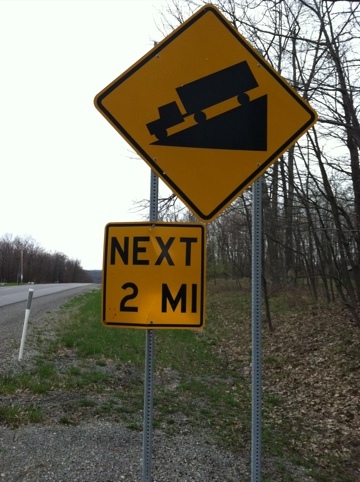 This sign was posted below a 1-mile steep downhill, making 3 miles of wild descent! And to get there, we had to go up first. Remember, we started on April 26 at sea level! A church window. Looks almost ecumenical. 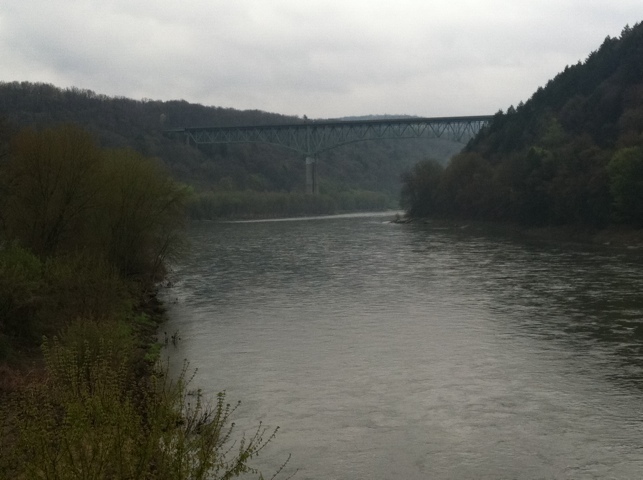 The river and bridge at Emlenton, just below the worst stretch of road we encountered in PA: long, narrow, steep, crumblng, grooved, plied by heavy trucks. 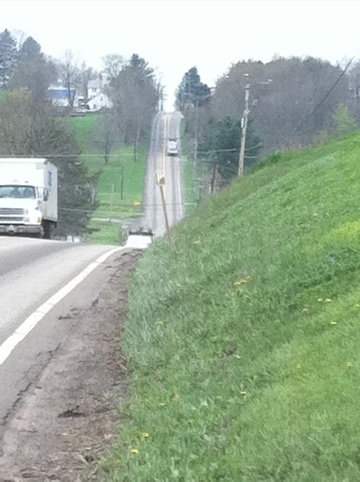 Imagine this incline stretching for a mile or more! This was our world for the past few days. 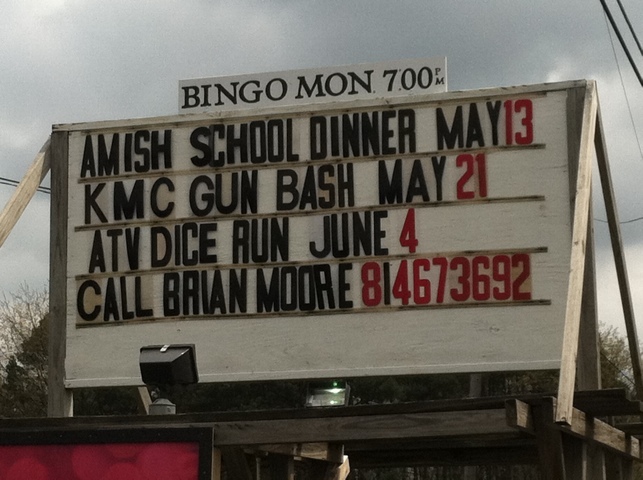 For all of rural Pennsylvania’s seeming homogeneity, there are different cultures and outlooks. 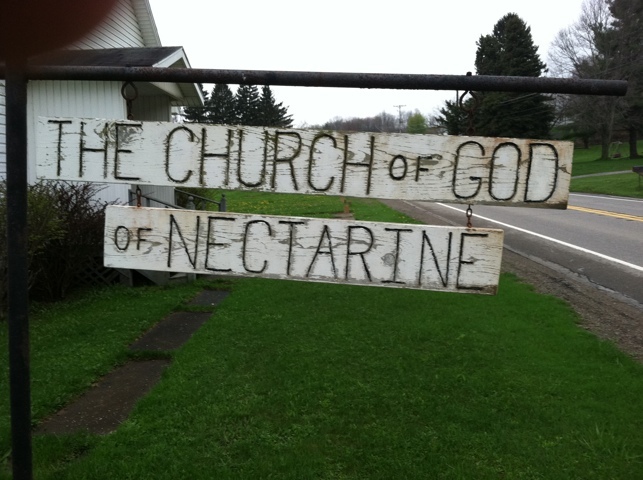 Bet you never heard of Nectarine, PA. How about Turkey City, PA? 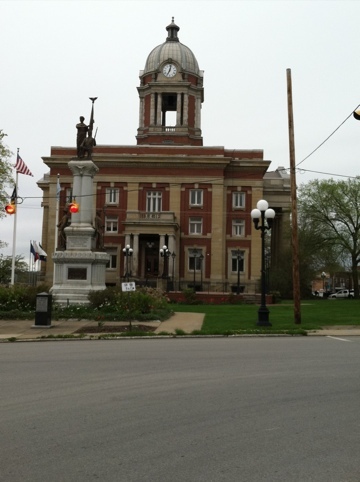 This is the Mercer County courthouse and Civil War monument. Pennsylvania has lots of these memorials and structures from an era of grand public works. The Mercer IOOF. 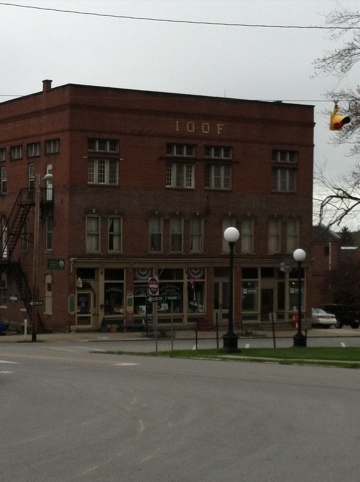 If you aren’t from the country, you may not recognize the International Order of Oddfellows.